1. Standard Squirrel cage induction motor is used to operate hydraulic/coolant/lube pump motors/ mechanical slide. 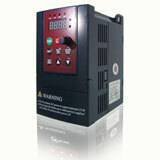 Motor is available with pole changing winding also for fixed speed operation. 2. Standard Squirrel cage induction motor with VFD is used for infinite speed variation for spindle application. However it must be remembered that Motor can be used from 10% of rated speed onward for better cooling. Motor will deliver constant torque/variable HP up to rated speed and constant HP/variable reducing torque above rated speed. Motor speed above rated speed is limited by bearing design of motor. 3. For position control, Servo motors are used. It provided both speed, and position control. 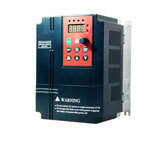 There are many applications that do not require servo motor, such as material handling elevators for production. They don't need to be fast, just accurate, and VFDs can do the job nicely.